Scott Holmes wrapped up his elite amateur hockey career with the Fond du Lac Bears in 1990. That same year, Holmes got the Fondy No Check Hockey League going and started his own team, Scotty’s Auto, named after his auto repair business in Fond du Lac, Wisconsin. Now, 28 years later, Scotty’s Auto is still running strong on the ice. “It’s real competitive and fast hockey,” said Scotty’s Auto team member Jeff Nelson. The league, which has six teams, is also going strong. It uses a draft system every year. That means Holmes has a couple of his longtime friends on the team every year. Holmes and Nelson have been skating together for nearly 50 years and were teammates with the Fond du Lac Bears. They are also the last two remaining original members of Scotty’s Auto hockey team. At 59, Nelson is the oldest player in the Fondy No Check Hockey League with Holmes not far behind at 57. The guys play against skaters who are as young as 18, but Holmes and Nelson hold their own. 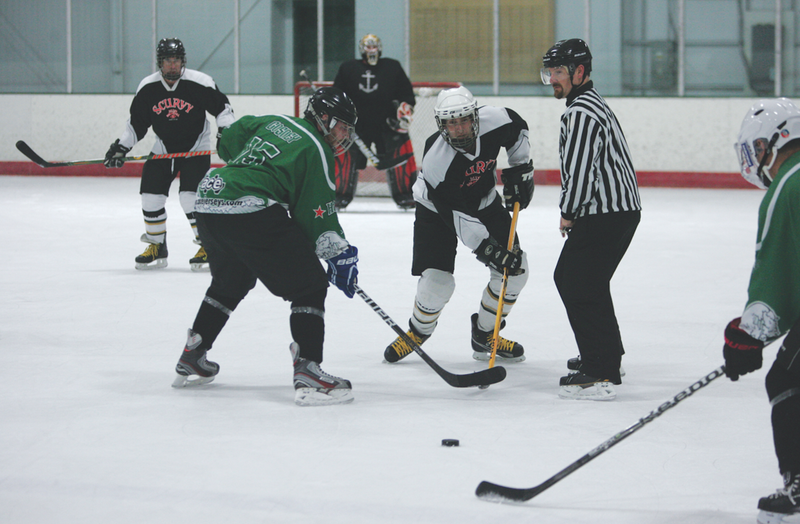 The league, which runs October to March, plays out of the Blue Line Family Ice Center and has some strong players. Things always start to heat up late in the season. Nelson loves getting on the ice once a week and staying active. Holmes, who skates on the team regularly with one of his three sons, gets a little extra boost to play hockey from the support people in his life. Holmes enjoys having former players he coached in the league. “It’s nice because they respect you because you’re so old and you’re still playing, but they still respect you because you’re still pretty good yet,” Holmes said. Along with playing weekly in the Fondy No Check Hockey League, a number of the Scotty’s Auto players compete in the annual Labatt Blue/USA Hockey Pond Hockey National Championships in Eagle River, Wisconsin. The guys drive the three hours north to hang out and play some hockey. The team plays under the name The Original Sicks, skating in the 50+ Tier I Division. In 2018, the guys went 1-2. It’s an unusual year when The Original Sicks don’t make the playoffs. A few years ago, the team advanced to the championship game of a 40+ Division but fell by a couple goals. The guys love getting a chance to get away for a long weekend to enjoy each other’s company.